3" wide Rims for Go Karts and Mini Bikes. Two Piece Wheels with 3 Bolt Holes on a 3.75" Bolt Hole Circle. Nice ball-burnished finish, designed for easy tire mounting. Bead biting edges prevent slipping. Grade 5 hardware included. 5/8 or 3/4 Bearings. Innertubes are required with all 2 piece split rims. The following tires fit 5" Tri Star Wheels: 3.40x3.00-5, 4.10x3.50-5, 11x4.00-5, 11x3.50-5, 11x4.50-5 and 12x4.00-5. 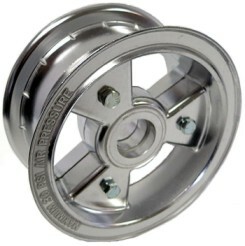 Two Piece 5" Aluminum Alloy Tri Star Wheel. 3" Wide with 3/4" ID Tapered Roller Bearings. 3.75" Bolt Circle. Dust Shield and Grade 5 hardware included. Innertubes are required with all 2 piece split rims. The following tires fit 5" Tri Star Wheels: 3.40x3.00-5, 4.10x3.50-5, 11x4.00-5, 11x3.50-5, 11x4.50-5 and 12x4.00-5 Bead Biting Edges Prevent Slipping. Ball-Burnished Finish. 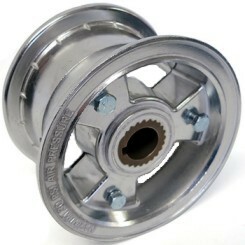 The 3" wide, 5" Live Axle Tri Star Wheels are used on keyed, round 1" OD axles with a 3/4" OD step down on each end. 3.75" Bolt Hole Circle. Grade 5 hardware included. 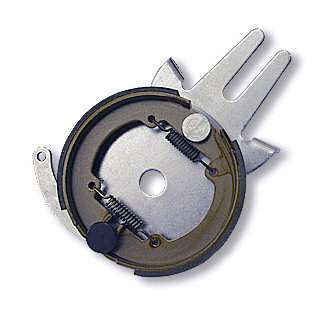 The inside wheel half has a 1" bore with a 1/4" keyway. 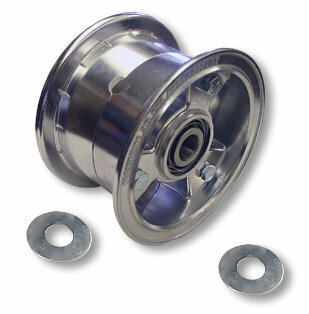 The outside wheel half has a 3/4" bore, no keyway. The 1" bore side of the wheel mounts up onto the 1" axle with a key installed to hold it onto the axle. The 3/4" bore side of the wheel "butts" up against the "step down". (the area where the axle goes from a 1" OD down to 3/4" OD) The 3/4" bore rim half prevents the entire wheel from being able to slide up onto the 1" part of the axle. They do not use hubs. Innertubes are required with all 2 piece split rims. The following tires fit 5" Tri Star Wheels: 3.40x3.00-5, 4.10x3.50-5, 11x4.00-5, 11x3.50-5, 11x4.50-5 and 12x4.00-5. 3" or 4" wide, 6" Two Piece Wheels with 3 Bolt Holes on a 3.75" Bolt Hole Circle. Designed for easy tire mounting. Bead biting edges prevent slipping. Grade 5 hardware included. Innertubes are required for all 2 piece split rims. The following tires fit the 3" wide Tri Star 6" Wheels: 4.10x3.50-6 and 13x4.00-6. The following tires fit the 4" wide Tri Star 6" Wheels: 13x5.00-6, 13x6.50-6, 14.5x7.0-6, 15x6.00-6, 5.30x4.50-6 and 12x6.00-6. These 4" wide, Two Piece 6" Live Axle Tri Star Rims are used on keyed, round 1" OD axles with a 3/4" OD step down on each end. 3.75" Bolt Hole Circle. Grade 5 hardware included. 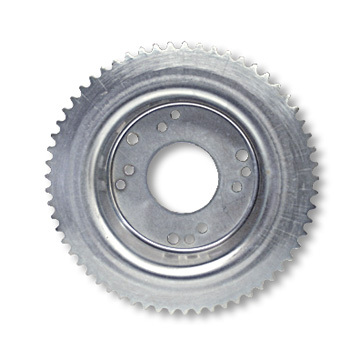 The inside wheel half has a 1" bore with a 1/4" keyway. The outside wheel half has a 3/4" bore, no keyway. The 1" bore side of the wheel mounts up onto the 1" axle with a key installed to hold it onto the axle. The 3/4" bore side of the wheel "butts" up against the "step down". (the area where the axle goes from a 1" OD down to 3/4" OD) The 3/4" bore rim half prevents the entire wheel from being able to slide up onto the 1" part of the axle. They do not use hubs. Innertubes are required with all 2 piece split rims. The following tires fit the 4" wide Tri Star 6" Wheels: 13x5.00-6, 13x6.50-6, 14.5x7.0-6, 15x6.00-6, 5.30x4.50-6 and 12x6.00-6. Fits 5" and 6" Azusa Tri Star Wheels. 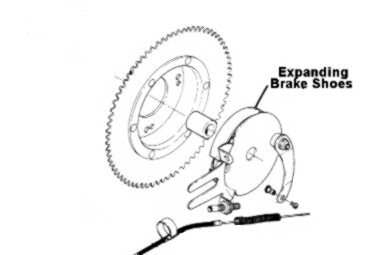 Uses 4-1/2" Internal Expanding Brake Shoes. 4-1/2", Steel Anchor with Brake Shoes. 5/8" Bore Brake for 5" and 6" Tri Star Rims.